Carnivals make everyone smile! Whether it’s you on the ride or your family and friends, we all smile when we hear that word. Here at Chinook Winds we love to make people smile and build memories. That’s why when we had the chance to host Davis Carnivals on their way through the area, we jumped at it! Visitors and locals will enjoy four days of fun at low prices. Join us during these family fun-filled four days, April 26-29, for a memory building adventure. Carnival rides, fun midway games and the food we all love await you. Discounted all day ride passes are available now through April 25 at the Chinook Winds Box Office or online. You can also purchase them each day if that’s easier for you. You can find out all the information you need here! This fun carnival comes right after a week-long community celebration in Lincoln City called Community Days. The events are centered around what makes Lincoln City, Oregon one of the best coastal destinations in Oregon. Several organizations and volunteers join together to create a week of activities that showcase everything (well, not everything) our small beach town has to offer. From playing golf on the mudflats of the Siletz Bay to raise money for local high school golfers to hosting a dog palooza where visitors and locals can share in the many talents of their 4-legged friends, we have something for everyone. 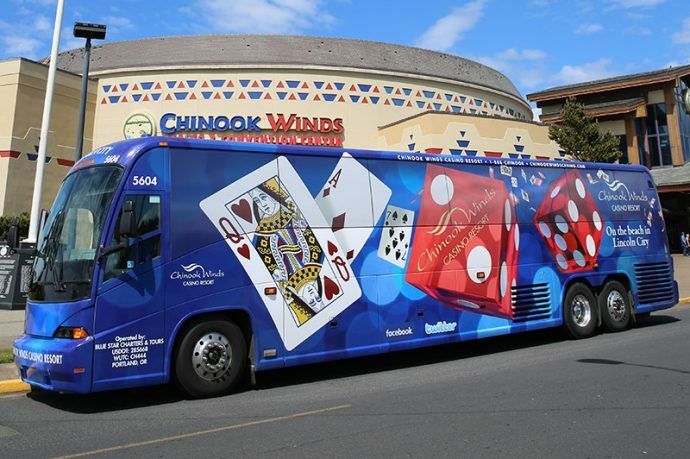 Our team at Chinook Winds makes every effort to participate in as many Community Days activities as possible. This year we partnered with the local High School and the LC Community Center to once again place the Pinwheels for Prevention on the front lawn for all passersby see our community stance against child abuse. This Pinwheel Garden has been sponsored by Chinook Winds for more than 15 years and it’s a tradition we don’t intend to stop. We are humbled by the support of the community in their commitment to helping us setup and tear down every year. Other activities we enjoy supporting are the Family Promise Lock-Up – “bailing out” local community leaders while raising money for homeless families; Radio Days, where all of the money is donated to three local non-profit organizations, and the Lincoln City Food Drive. Members of our team spend an hour, rain or shine, gathering food and money for our local food bank. We love participating in the Mudflat Golf Tournament by supplying both teams and prizes. This fun rain or shine event is a great tradition of raising money for the local high school girls and boys golf teams. It’s an opportunity to get out there and meet some youth in our community. The week ends with a Banquet at Chinook Winds Casino Resort where men, women and youth are honored for their contributions to our community. We will once again present our Community Spirit Award, where we choose an individual who we are proud to work with, or who has worked hard in our community throughout the year to be an ambassador of why our community stands above those around us. We are proud to be a part of this small coastal town with a big coastal heart. If you have ideas of what you would like to see featured in future blogs, send us a note to heatherh@cwcresort.com. Angels Stand Up and Sound Off!